This will be open for your eyes to see in T minus four days so I reckon Sat/Sunday! In other news I am working on a rad full video! It will be made of footage from Mikey P(master blaster). Robbo(King Crimson). The Leicester boys(Lost boys). Myself(Fatty Bombatty). Maybe Froggy(Ninja cat) and then another mix section from Chris Jenner(Americas got talent) and Rich Shaw(Wild fox). It will be available for £7 and will have screen printed cases made from the finest card and will contain stickers and some original artwork. Very excited about it and I hope to have it all completed by Christmas. Santas going to be blown away. 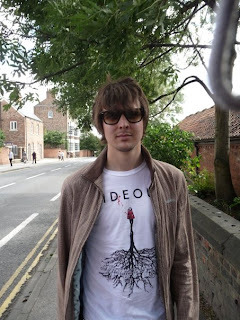 Danny Lewsley here with a hideout Little red t shirt, looking rad! Hideout web video hits 10k in 10 days! Best T shirt picture yet!